As the mother of a child with Down Syndrome (see Molly’s story here), I cried happy tears yesterday for a child I’ve never even met. It was homecoming last night for Fletcher High School, here in Jacksonville. Every girl dreams of being crowned homecoming queen (okay, so I didn’t, but most do!). 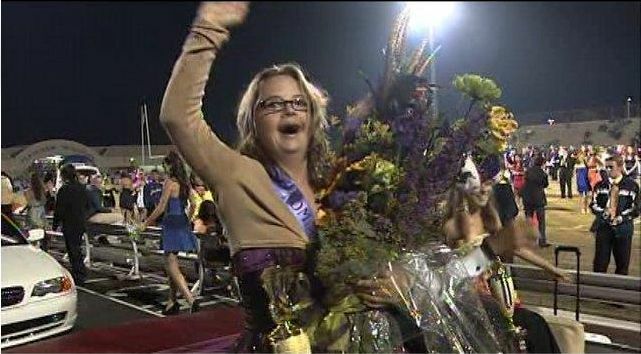 Cara Stieglitz, a Fletcher student with Down Syndrome was in the running for homecoming queen… and she won! Isn’t that just the coolest?! Here’s a link to one of the many local news stories. The students of Fletcher High School should be applauded for accepting Cara. They have made the dreams come true for an amazing girl who has achieved and overcome so much in her life. I hope she knows that she’s not just an inspiration to those with Down Syndrome, but she’s an inspiration to everyone who faces hurdles and struggles in their lives. I can’t wait to share Cara’s story with my Molly one day! She’s such an awesome inspiration and role model! Can’t you just picture Molly wearing the Homecoming Queen crown one day? I can! How awesome! I never aspired to be homecoming queen but as you said some girls do and cheat and lie to make sure they win! That is just so inspiring for a girl like Cara and your Molly to win. I teach in a Christian high school, and I thought I knew some of the best kids in the country. But these kids at that high school surpassed them! I read the local news story and saw the photo of lovely Cara. The whole thing brought tears to my eyes! Thanks for sharing it here. What an inspirational story! This is a story that needs to be shared across the country to teach acceptance. Congratulations Cara!!! Thanks Pam and Renee Ann! I can't wait till my Molly is old enough to see this story! Truly an inspiration! SSS – You are exactly right! This is a story that everyone needs to see! The lessons that can be learned from this story are amazing!